But there is even more to the level of respect and affection than meets the eye. The Times of India explains that even PM Modi’s fashion choice was meant as a tribute to Israel. He wore a white suit with a blue handkerchief to represent the colours of Israel. What a beautiful gesture! What a mensch! With bilateral relations at all-time high, India’s Prime Minister Narendra Modi has embarked on a 3-day visit to Israel today. Prime Minister Modi becomes the first ever sitting Indian premier to visit the Jewish State. Developmental issues such as agriculture technology and water management will be high on agenda during the historic visit that marks the 25 years of bilateral diplomatic ties. Both countries are expected to sign an agreement setting up a $40 million innovation fund to finance joint research in agriculture, water, energy and technology during the prime ministerial visit. “In the last few years the world has seen the India Israel relationship come out from the perception of just Defense related activities to showcasing a fantastic connection in agricultural, educational, entrepreneurial & cultural cooperation. It’s these new areas which are making this bilateral a model for the rest of the world to follow.” Rishi Suri, senior international affairs editor at Indian newspaper Daily Milap, told Israellycool. Behind the overt affection and friendship, lies deep political significance as India for the first time has delinked its relationship with Israel from its traditional support to Palestine. But, India now hopes to leverage its relationship with Israel to attract more investment, and gain from Israeli cutting-edge technology and defence. On a historic visit that started with firm handshakes, hugs and a smattering of Hindi and Hebrew, Prime Minister Narendra Modi will get down to business today with back-to-back meetings with Prime Minister Benjamin Netanyahu and other Israeli leaders that will focus on cooperation on defence, security, water and more. Apart from the multiple pacts that the two strategic partners are expected to seal at Wednesday’s meetings, the two leaders are also expected to deliver a strong message against terrorism in their joint statement. Both leaders had yesterday spoken in one voice to resolutely combat terrorism and radicalism. Revenue worth USD 25 billion can be generated in India and Israel through cumulative cross- border investment into start-ups in these two countries, a joint report by Nasscom and Accenture today said. The report titled ‘Collaborative Innovation: The vehicle driving Indo-Israel prosperity’ noted India and Israel’s innovation ecosystems share unique innovation complementary traits in three areas — temperament, talent and technology. “In reorienting India’s foreign policy, Narendra Modi is responding to history and realpolitik,” commented the often left-leaning Indian news website, FirstPost. There were prominent voices in support of Prime Minister’s visit, even within the main opposition Congress Party. The former Deputy Foreign Minister Shashi Tharoor praised Prime Minister Modi’s diplomacy on Israel. “[This] shows our relationship has reached a level of maturity which makes it possible for us to contemplate first ever PM visit [to Israel],” Tharoor said. A truly historic moment would be if India were to disassociate itself completely from the Palestinian question – it is not as if it has contributed in any meaningful way all these years. The issue does not affect India and is best left to the concerned parties to resolve, much as India insists on Kashmir. If India’s voting at international fora were to shift to reflect this new position, such a move would give Israel much diplomatic room to manoeuvre. Of course there was whining from the Palestinian camp, but that is hardly news. It would only be newsworthy if they had welcomed such a visit. But amid all the compliments paid and deals struck, perhaps most striking about Modi’s historic visit were the things that weren’t mentioned. Iran — a close Indian ally — for example. The Islamic Republic’s ongoing destabilizing actions in the region and continuous calls for Israel’s destruction were not raised, or at least not publicly. In meetings with world leaders, even those with good relations to Tehran, Netanyahu usually doesn’t shy away from talking about Iran. Last December in Astana, for instance, he asked Kazakh President Nursultan Nazarbayev to send a message to Tehran. “Ask … why Iran continues to threaten us with annihilation. Don’t you understand: we’re not a rabbit. We’re a tiger,” he said. Hosting Modi, Netanyahu refrained from belligerent statements directed at Tehran, despite the fact that Iranian terrorists were responsible for a 2012 terror attack in New Delhi, during which an Israeli was wounded. India never made any arrests in this case. More importantly, the Palestinian issue was entirely absent from Modi’s visit. The Indian leader’s intention to separate Delhi’s friendship to Israel from its support for the Palestinians was evident once it emerged that Modi would visit Israel but skip the Palestinian Authority. But it was even more remarkable that in several speeches Modi made in Israel, he never cited the issue. The premier of India — a state which in 1947 opposed the UN Partition Plan and, 65 years later, supported granting the “State of Palestine” nonmember state status at the UN General Assembly — did not endorse Palestinian statehood once during his time here. He did not mention the two-state solution or the principle of two states for two peoples. Herb Keinon in the Jerusalem Post similarly notes that Narendra Modi spent over two days in the country – and never once mentioned the Palestinians, nor did he visit them. But one of the most refreshing aspects for Netanyahu was certainly that Modi did not publicly lecture or hector about the Palestinian issue. Had he come here and not coupled his visit with a quick trip to Ramallah to see Palestine Authority President Mahmoud Abbas, that – in Netanyahu’s eyes – would have been enough. But Modi did even more than that. He didn’t even mention the Palestinians in public. He didn’t slam Israel for the settlements. And in the joint statement carefully drawn up by both sides spelling out the underpinnings of the relationship, the Palestinians were not mentioned until the 20th clause of a 22-clause document. And even there, India – which was the first non-Muslim country in 1987 to recognize “Palestine” – spoke only generically about a “just and durable peace in the region,” without explicitly calling for a two-state solution. Netanyahu had to wish that all his guests – especially those from Europe – behaved like Modi. Why? What happened? How come Modi, whose country for decades was at the forefront of championing the Palestinian cause, did not even give the issue public lip service while here. There are many reasons, some having to do with how Asians do business, others with how Modi prepared the ground for the trip, and still others dealing with India’s emerging power and status in the world. One of the reasons, the officials said, is that India detests when other countries lecture and hector it about its fraught relationship with Pakistan, an indication New Delhi has internalized – at least when it comes to Israel – Hillel’s famous dictum about not doing to others what is hateful to you. Secondly, Modi could get away with making this a strictly bilateral trip because he carefully prepared the ground for it. Elected in 2014, there was talk that he would come to Israel already in the summer of 2015. He didn’t. He waited. He first went to Saudi Arabia, Iran, Qatar and Iran, where he obviously explained the nature of India’s relationship with Israel, and that improved ties with Israel would not come at their expense. He also invited PA President Mahmoud Abbas to New Delhi in May, publicly supported a Palestinian state, and pledged that India’s historical support for the Palestinians would not waver. In other words, he got all his ducks in a row before making his historic trip to Israel, something important from an Indian perspective considering that more than seven million Indians live and work in the Persian Gulf. One of the reasons often given in the past for the brakes the Indians put on the relationship with Israel, was that a high-profile relationship would infuriate India’s Muslims. India’s Muslims did not take to the streets when it became clear Modi wanted to visit, they didn’t raise a hue and cry. One conclusion is that the resonance of the Palestinian issue on the Muslim- populations in non-Arab countries is not as great as is often imagined. Another conclusion is that with all the turmoil in the Middle East, with the hundreds and thousands who have died in the region since the Arab Spring, the Palestinian issue has simply dropped as a priority issue. If only other countries could learn from India and follow their lead, how different would the world, particularly the Middle East, look today. The three-day visit was brimful with grand gestures — including plenty of Modi’s trademark hugs — and mutual declarations of love and admiration. Modi’s jam-packed itinerary comprised political talks with the government and the leader of the opposition, and secret talks on improving counter-terrorism coordination. There was an emotional meeting with an 11-year-old Jewish boy who lost his parents in the 2008 terror attack in Mumbai. Modi addressed a Bollywood-infused concert/rally for Israelis with Indian roots. And after paying his respect to the six million Jews who perished in the Holocaust, he spontaneously visited the nearby grave of Zionist visionary Theodor Herzl. A floricultural center named a flower after him, and he took a stroll with Prime Minister Benjamin Netanyahu at the beach. The photos of the two leaders, their bare feet in the water as they chatted about Israeli desalination techniques, will go down in history as one of the most iconic images to come out of Israel since Netanyahu and Barack Obama took off their suit jackets at Ben Gurion Airport in March 2013. On the economic front, too, the visit will have an impressive lasting impact. Israel and India established a $40 million Industrial R&D and Innovation Fund, and individual companies from both nations signed deals worth millions. Jerusalem and Delhi signed seven bilateral agreements, covering technology, agriculture, water and even space research. “We already agreed that the sky is not the limit because we’re doing it in space, but I think that the talents that we have in India and Israel are amazing and the possibilities are amazing,” Netanyahu said Thursday at the launch of the Israel-India CEOs’ Forum. Modi formally invited Netanyahu to visit India, something the Israeli leader had dreamed about for years. On a more serious note, in a very moving and emotional moment , Modi met with Moshe Holzberg, the little boy who was saved by his Indian nanny during a terror attack in Mumbai in which his parents, Chabad emissaries Rabbi Gavriel and Rivka Holzberg Hy’d, were killed. The 11-year-old son of Chabad emissaries who were murdered in a 2008 jihadist rampage in Mumbai told visiting Indian Prime Minister Narendra Modi that he loves India and wants to return to complete the mission of his slain parents, during an emotional meeting Wednesday. Modi met with Moshe Holtzberg, pulling the boy close for an embrace and telling him that he would always be welcome in India. Moshe’s nanny, Sandra Samuel, escaped from the Nariman Chabad House carrying 2-year-old Moshe in November 2008 after the building came under siege. Four Jewish victims were killed, including Moshe’s parents, Rabbi Gavriel and Rivka Holtzberg. Samuel has remained in Israel and was at the meeting as well. At their meeting at a hotel in Tel Aviv, Modi immediately embraced Moshe, pulling him close and cupping his head against his chest before inviting him to come back to India. The boy, accompanied by his grandparents who are raising him, welcomed the Indian premier to Israel. I challenge you to have a dry eye at seeing this courageous little boy, all grown up, speaking two or three languages, and having developed so well thanks to his brave nanny Sandra Solomon and his wonderful grandparents and family. 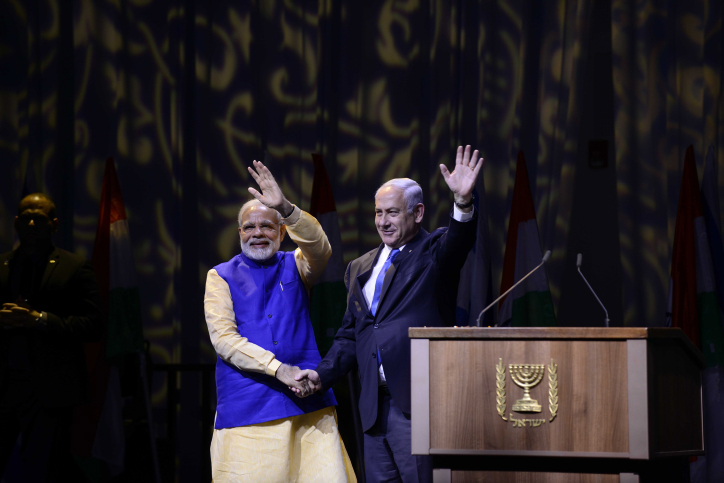 On Wednesday, thousands of Indian Israelis gathered in the city to greet Indian Prime Minister Narendra Modi and Prime Minister Benjamin Netanyahu in a glitzy, wild welcome for the first premier from their home country to visit the Jewish state. 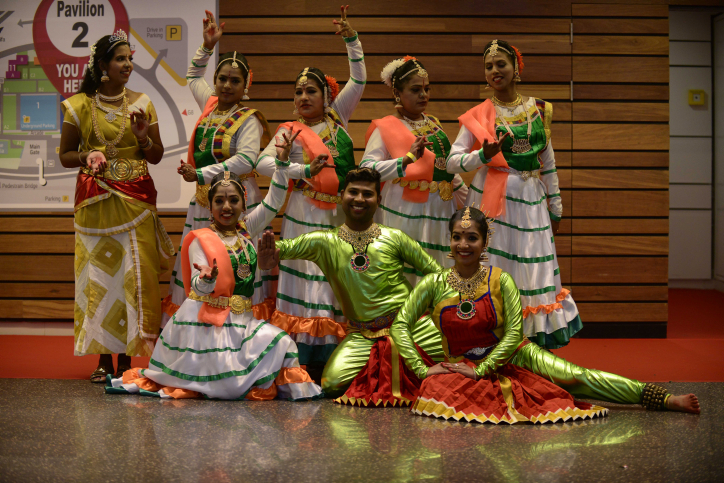 Brightly colored Indian saris mingled with jeans and t-shirts — and not a few kippot and religious headscarves — at Wednesday’s event, which began with several Bollywood dance acts and a concert. “It gives me chills,” said Naomi Yakub, who immigrated to Israel from India in the early 1970s and is part of a community of some 100,000 Indian Jews living in the country. For the Jewish community in Israel, “a meeting like this we haven’t had in 45 years,” she said. But the culmination of the community’s raw elation was reserved for the moment Modi and Netanyahu walked on stage to Academy Award-level applause and a solid two-minute standing ovation. 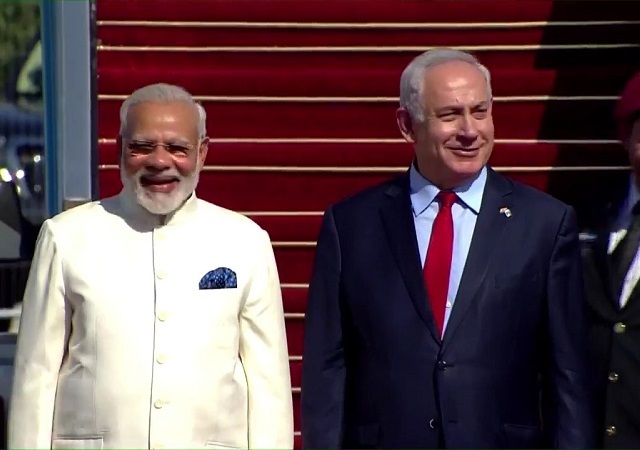 The leaders — Modi dressed in blue-and-beige, Netanyahu in a blue tie — clasped hands triumphantly in the air. “Modi! Modi! 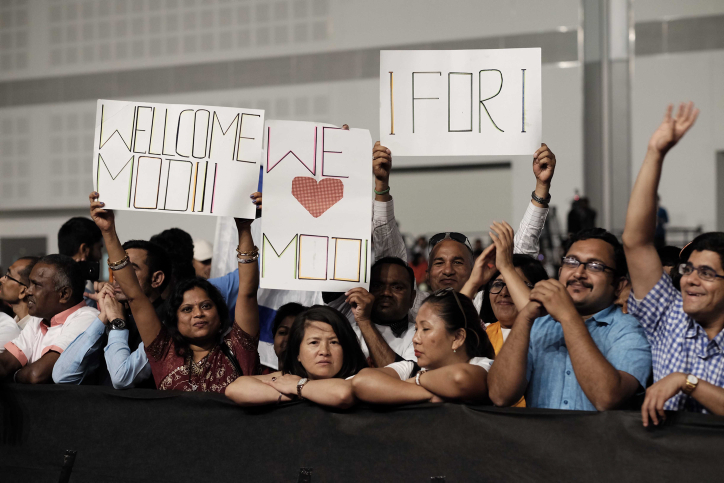 Modi!” chanted the observers, some of whom wore “I am a fan of Narendra Modi” t-shirts. Taking the stage after Netanyahu, Modi gave a lengthy speech in Hindi to the crowd of mostly Indian immigrants. For Israel’s Indian community, it certainly was. Not only for Israel’s Indian community. For all of us. Safe journey home Mr. Modi. May our two countries continue on the path to deep and warm relations for our mutual benefit. This entry was posted on July 7, 2017 at 5:32 PM and is filed under India, Israel, Israel and India. You can subscribe via RSS 2.0 feed to this post's comments.